Kids will love this simple Surface Tension science experiment for kids of all ages. Water molecules like to stick together. On the surface where the water meets the air, water molecules cling even more tightly to each other. This is called surface tension. To lower the surface tension of water, you can heat it up or add soap or detergent. These two things cause the attraction between the water molecules to lessen. In the case of the cotton balls, the structure of a cotton ball is lots of wound cotton fibers with tiny pockets of air between then. 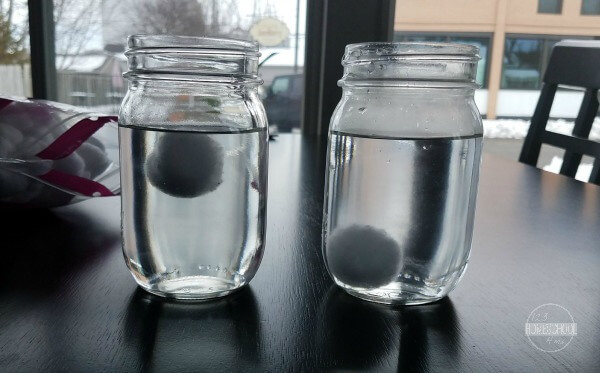 When the cotton ball first hits the cold water, it is lighter than the water and floats. Then, water starts to slowly creep into those air pockets and replace the air. This causes the cotton ball to eventually sink. When the cotton ball hit the glass of hot water, the same thing happens as in the cold water, but at a faster rate. This is caused because the surface tension of the water is lower in this glass. This makes the water move into the cotton balls much faster. Try this experiment again by adding a couple drops of dish detergent to a glass of cold water. Compare the rate the cotton ball sinks to the plain cold water and/or the hot water. What are the results and why? You can, also, try the varying temperatures of water or use different types and amounts of soap. 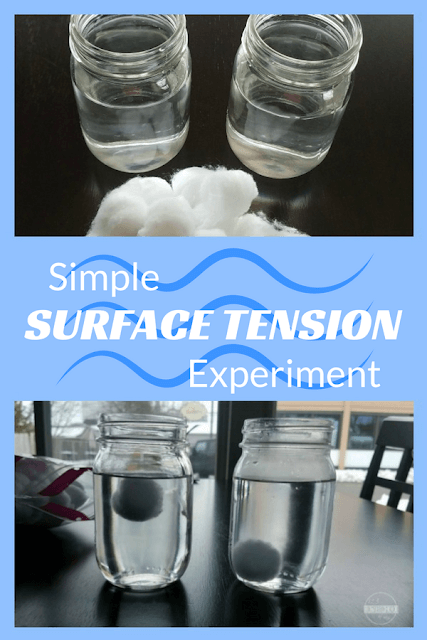 Try this simple surface tension experiment to teach about one the fascinating properties of water. 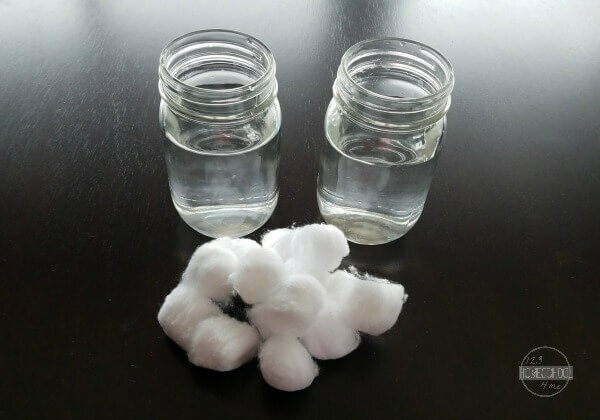 Grab 2 or 3 glass jars or drinking glasses, 3 or more cotton balls, water, and liquid dish detergent. Fill one of the jars with cold water and another with hot water. Drop a cotton ball into each of the glasses at the same time. Notice what happens to the cotton balls. Do they sink or float? Does one sink faster than the other? Why? Here’s a hint: What you are observing is a result of the surface tension of water.